I know the feeling. You have a baby, and after the hectic first few weeks or months, you’re eager to travel again. Figuring out what to bring, how to navigate airports and airlines and what to do with the baby when you’re onboard is overwhelming. 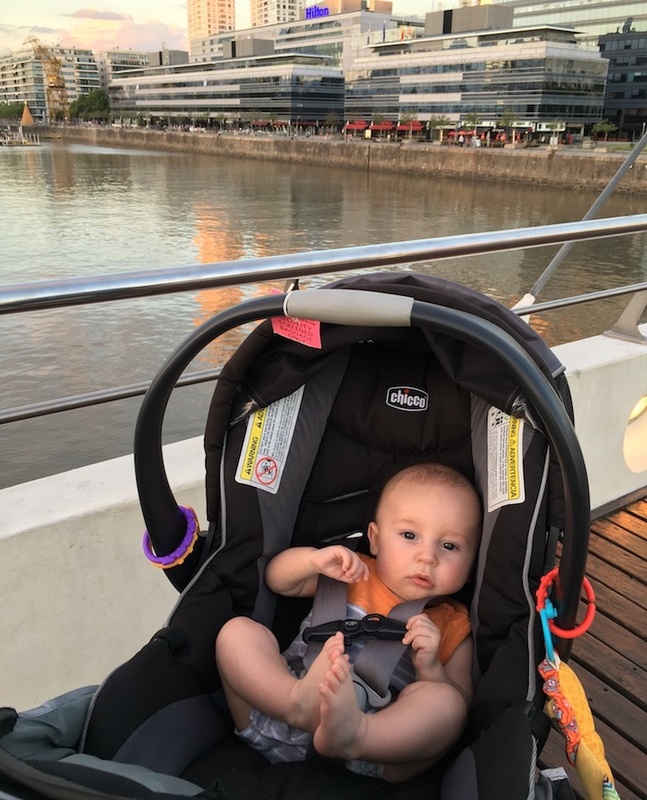 I’ve been getting a number of questions from new parents on the subject of traveling with a baby lately and so I’ve decide to share the answers I gave here. 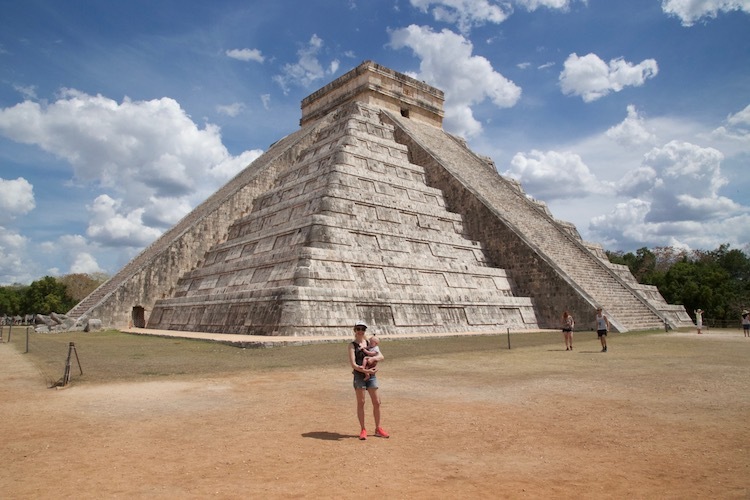 El Castello at Chichen Itza in the Yucatan. Should I bring a carseat? This depends on what type of trip you are embarking on. Are you renting a car? If the answer is yes, then you can always rent a car seat from the car rental company. 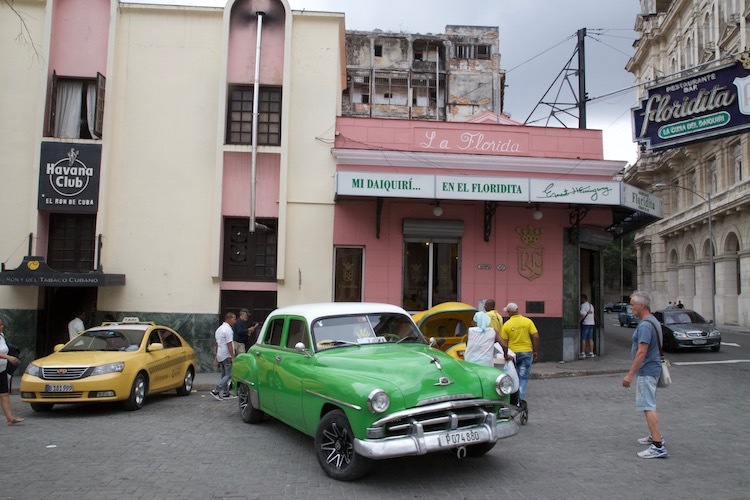 Are you going to be doing a mix of car rentals, taxis and Ubers? Then you will probably want to bring your child safety seat. Keep in mind that many car seats like the Chicco KeyFit 30 Magic can be used safely without the base. You may want to consider leaving it at home to reduce weight. It’s also a good idea to bring it if your baby is still riding in a stroller with a car seat attachment. Off to the United Kingdom. What can you check for free? Most major airlines including Delta, American Airlines, United Airlines, Alaska Airlines and their partners check car seats, car seat bases and strollers for free. When you get to the airport, you will have to decide whether you want to check it at the counter or wait until the gate. Some people like to check their car seat and stroller at the counter and carry the baby through security with a baby carrier like an Ergobaby 360 . I prefer to have the stroller with me. That way I can use it to carry our diaper bag and other personal items. American Airlines allows a complimentary diaper bag for each infant under two (not all airlines do so you may need to check). Bring your car seat with you through security only if you’re going to use it in your stroller attachment. It’s just extra weight otherwise. Most airlines will include a Pack ‘n Play or baby bed as part of your standard baggage allowance, so you will have to pay for this. Alaska Airlines allows you to check a bed for free on domestic flights. Wylie, don’t get used to this. Where should we be sitting on the plane? Children are not allowed to sit in emergency exit rows, so resist the urge to book a seat there for the extra legroom. Booking a seat in the back of the airplane is never a bad idea. Those seats are most likely to go unbooked on a crowded flight meaning you may increase your chances of having a free seat next to you. I believe in having an aisle seat with a baby, especially if you are traveling alone. This makes it easier to get up and walk around and make trips to the bathroom. On international flights, you should try to score a bulkhead seat with a baby bassinet. The flight attendant will attach it to the wall during the flight. To do this, call the airline you’re flying ahead of time and tell them you would like to request the bassinet. When you arrive at the airport request it again at the check-in counter and then follow-up at the gate. It’s supposed to be first come first serve (there’s usually one bassinet onboard). The squeaky wheel gets the grease so be persistent. In Buenos Aires after a long flight. Children can ride on your lap until they turn two. This is free on domestic flights, but they still need to be listed on your ticket. Sometimes you can add them during the online booking process. Most likely you will have to call the airline and add them over the phone. On international flights you will have to pay a fee for a lap infant. This will be about 10 percent of your ticket price. Do not wait to do this until you get to the airport. You may have to pay more or risk being able to board the flight at all. As soon as you book your flight, call the airline, add the infant and pay the fee. Just like adults, babies will have to have a passport to travel internationally. Wylie had his passport photo taken when he was 7 days old. 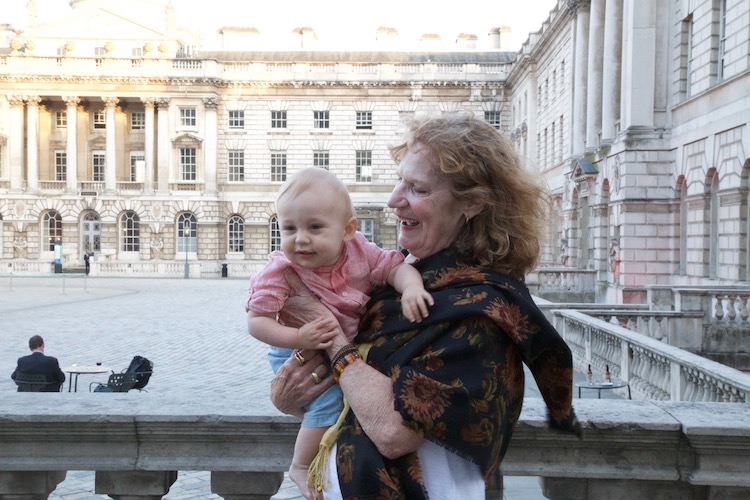 In London with great grandmother Lulu. What stroller is best for traveling? When Wylie was young, we liked to to use the Thule Urban Glide 2.0 with a car seat attachment. This is a rather bulky option, but it was durable and had plenty of room for us to stash things when navigating the airport. I switched to the Babyzen YOYO when Wylie turned six months. The compact and well made stroller folds up to be so small, it can fit in an overhead bin. Depending on how full the flight is, the airline may still ask that you gate check it if you already have one carryon bag and one personal item. 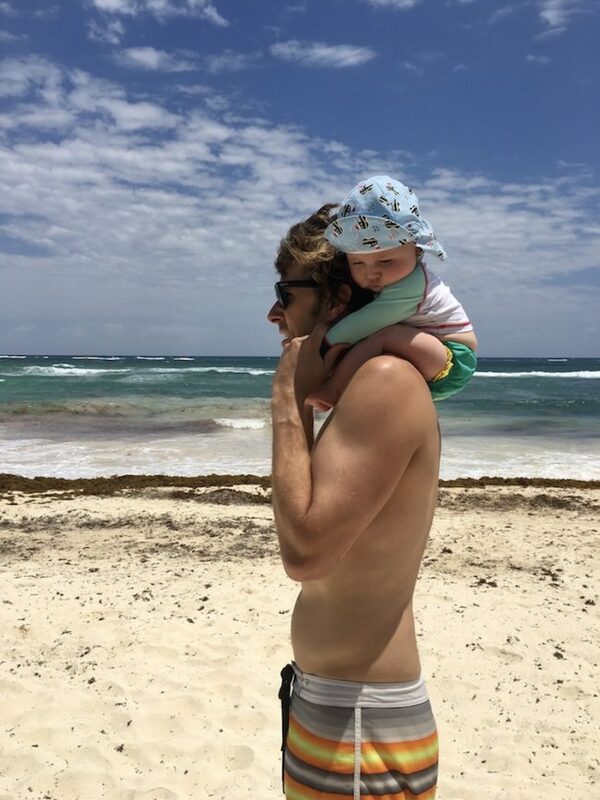 Wylie and dad on the beach in Tulum. What items are essential for bringing to the airport and on the airplane? The airlines permit babies to have liquids. You can take breast milk and formula, pureed food packs, diaper cream, baby sunscreen and children’s water bottles through security. Seal these items in plastic ziplock bags and taken them out of your carry on baggage to avoid an additional screening check. Screening agents may want to swab the bottles and take a sample of milk or formula for testing. Make sure your breast milk/formula is still frozen when you go through security to avoid this. Bring a soft cover up if you’re breast feeding. Nursing is great during take off and landing because it will help keep your baby’s ears from popping. And bring some fun stuff. This is the time to brake out that chewable bracelet or necklace you got at your baby shower if your baby is teething. Bring a colorful, articulating toy that can suction onto the tray table. A book or two is always good. Bring a sticker book for toddlers. And these Crayola Color Wonder Mess-Free Coloring Kits are amazing! Can you believe we took Wylie to Cuba and didn’t take one family photo? 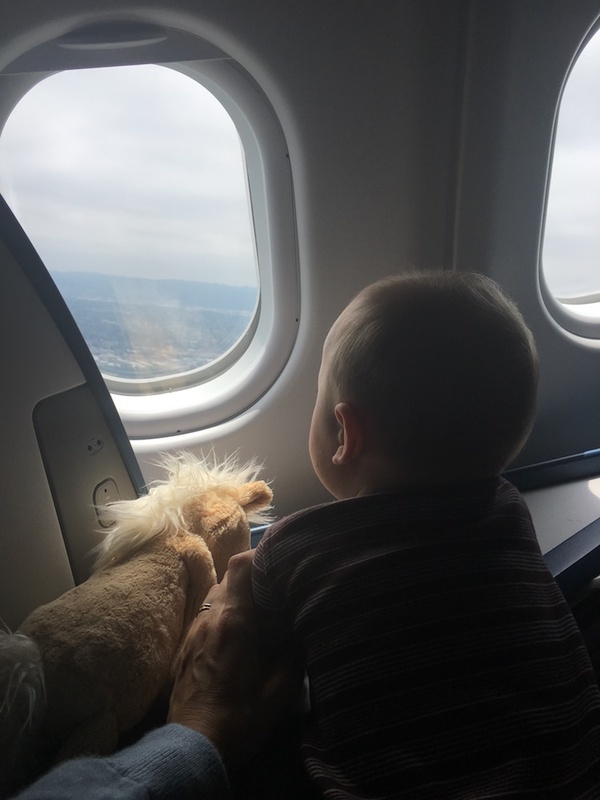 There are undeniably a number of things you will need to bring when traveling with a baby, but try not to go too crazy with toys and equipment. If you are going to be renting a car at your destination, consider leaving the car seat at home and renting it when you get there. The more you bring, the more you have to deal with and remember. Try to bring things that can do double duty! The one thing you don’t want to forget, or skimp on, is snacks. Happy Baby Clearly Crafted Stage 2 Organic Baby Food packs were essential until Wylie could start eating solid foods. If you’re baby is soothed by a pacifier have one or two or three stashed in your pocket! If your baby has a passport, he/she can sign up for Global Entry. You should too if you’ve haven’t done so already. More on that here. Try to schedule flights to correlate with your child’s nap time. A sleeping baby on the plane is probably best for everyone! Have additional questions come up? Please let me know in the comments below.